Provide pithy and hollow-stem nesting for native bees. Tunnel-nesting bees are great pollinators of early-blooming fruits and will lay their eggs in hollow tubes such as bamboo, paper tubes and drilled holes, and the pithy stems of staghorn sumac, raspberry and elderberry. Reduce lawn area and plant wildflowers instead. Reducing lawns by planting a native wildflower border at least three feet wide around them creates more habitat for pollinators. Also, raise your mower height to 4 inches and overseed with clover and other bee-attracting flowering plants. Connect with neighbors’ habitats. Connectivity of habitat is good for all wildlife, including pollinators. They can find larger areas to mate, lay eggs and visit flowers you plant for them. Consider joining with your neighbors to plant along your property lines. Join a Pollinator Protection group. Organizations that have stepped up to face this issue include the Pollinator Partnership, the Xerces Society of Invertebrate Conservation, Friends of the Earth, and the U.S. Fish & Wildlife Service. Stop applying pesticides to your lawn. Most pollinators nest in the ground and need access to pesticide-free soil. 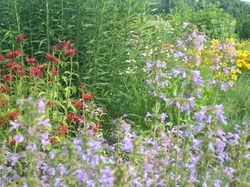 Plant truly pollinator-friendly–“neonicotinoid-free”–seeds, plugs and potted plants. Avoid so-called “pollinator friendly” plants that include systemic pesticides in the potting soil, since these pesticides are implicated in many honeybee and native bee deaths. Be sure to ask about what is in the potting soil of plants you intend to purchase and see ask a lot of questions. See list of 7 questions to ask your plant purveyor. Promote municipal “bee-friendly” practices. All towns have areas where bees and butterflies could live peacefully. Encourage your town to consider planting native wildflowers along roads, paths and walkways. Ask your local elementary and high school to plant habitat for butterflies and honey bees. Grow and buy local organic food and plants. Through our purchases we can ensure support for healthful growing practices that protect soil life and the food we eat, which foster the pollinators who make seed possible. Our buying power is leveraged when we connect the dots between the food on our plates and a healthy landscape for pollinators and all life. Take pesticides to hazardous waste collection day. If you have already purchased systemic pesticides, ask your nursery or garden center to take them back. If they can’t or won’t, take them to the Hazardous Waste Collection Day in your community. Get to know native bees. The majority of native bees do not sting, or have little effect if they do. Get books on their identification and take classes by local experts to learn more. Get to know the difference between wasp, hornets and pollinating bees. Even though a bumble bee will sting if you bother their nest, you can actually pet them when they are gathering nectar and pollen from flowers.